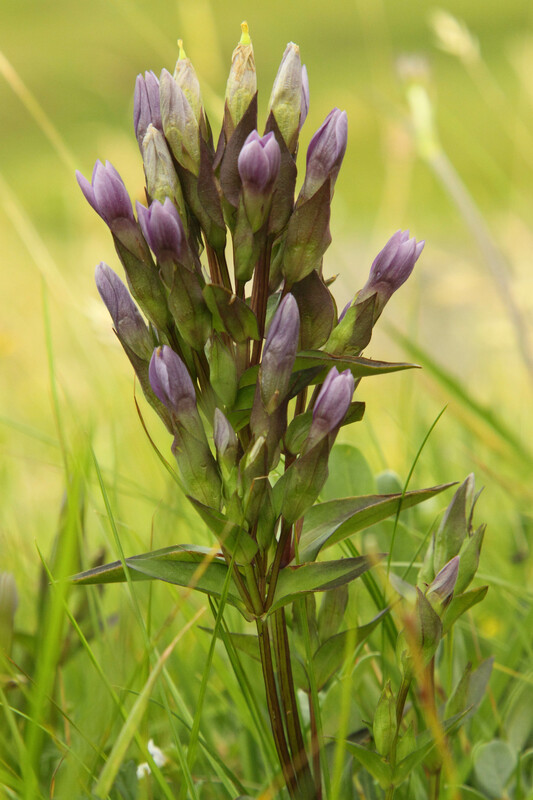 Steve has sent 450 July records including Cakile maritima (Sea Rocket) from a completely new area – Kilmarie on Skye. 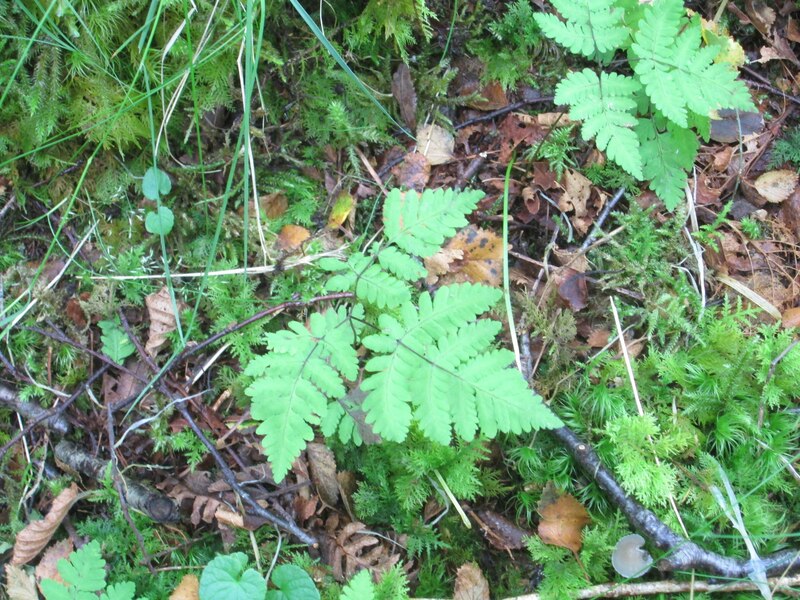 Other notable records included Osmunda regalis (Royal Fern) from a new area near Loch Ainort and an update for Polystichum lonchitis (Holly-fern) on An Stac near Blaven. Joanna has sent records from a tetrad including Kildonan and Flashader that had very few records, and also from some nearby tetrads and Loch Eishort, Ramasaig. 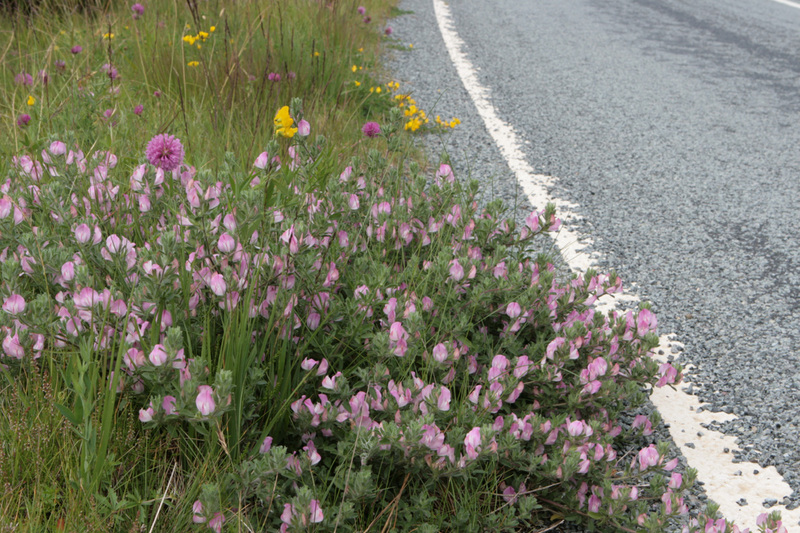 In the main tetrad she has added Centaurea montana (Perennial Cornflower) as an escape, something that isn’t very frequent on Skye and the tetrad taxon count has risen from 5 to 144 – with a few possible additions yet. 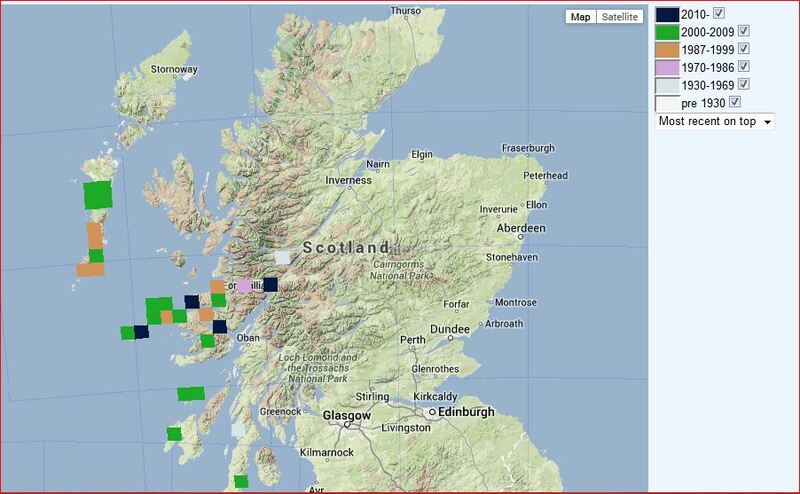 Loch Eishort records included Rosa x dumalis (Rosa caesia x canina) and Chara virgata (Delicate Stonewort). Michael & Paddy had a few hours on Eigg and updated a record for Ajuga pyramidalis (Pyramidal Bugle) and a few other species. 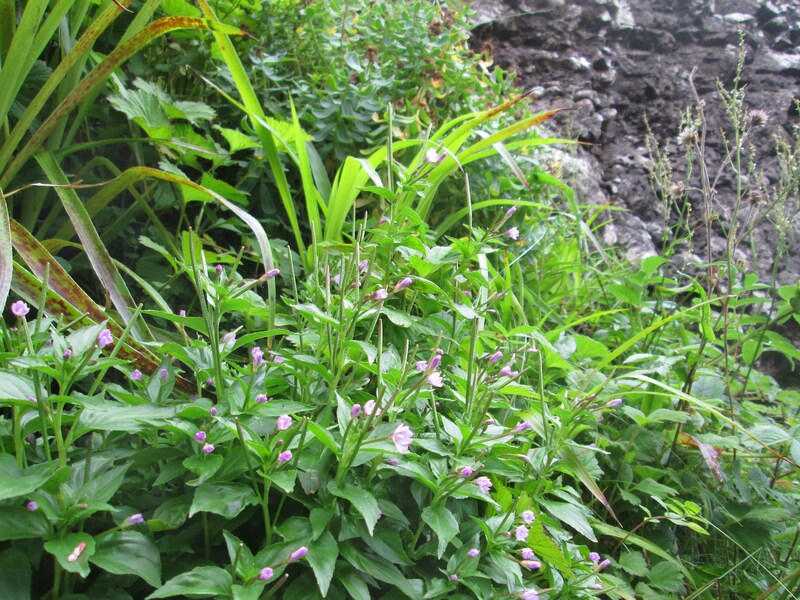 Meanwhile, I have been in Coir’ an t-Seasgaich measuring things for SNH, but also seeing interesting plants. 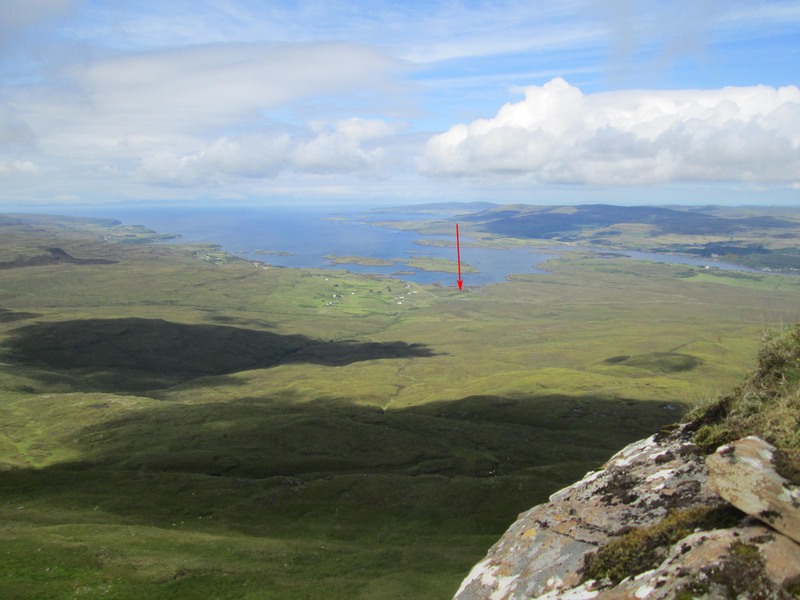 Part of what I am doing is in NG45T where there are only 6 previous records resulting in some curious gaps in distribution along the Trotternish Ridge. This is being improved…. This a beautiful gorge though quite a long section of it was missed out today as the only sensible access would appear to be in swimwear and we were not kitted out for that. This may explain why we failed to find some plants previously recorded there such as Asplenium viride (Green Spleenwort), Carex remota (Remote Sedge), Carex sylvatica (Wood-sedge), Populus tremula (Aspen) and particularly Melica nutans (Mountain Melick). 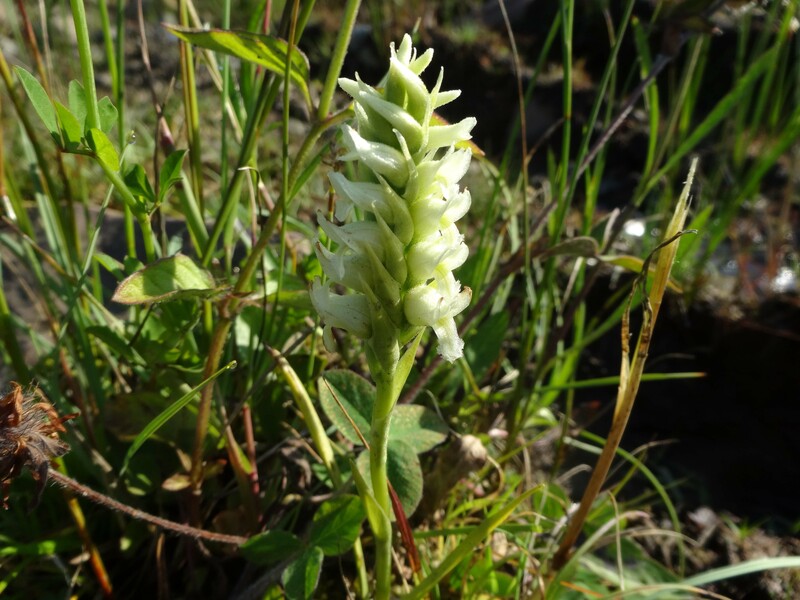 Mike Ingram, the Reserve Manager, has found two spikes of the Nationally Scarce orchid, Spiranthes romanzoffiana (Irish Lady’s-tresses) on Rum. This is the first record for the vice-county and a plant that I have long hoped to see here as it is in adjacent vice-counties. Excellent news on a wet afternoon! 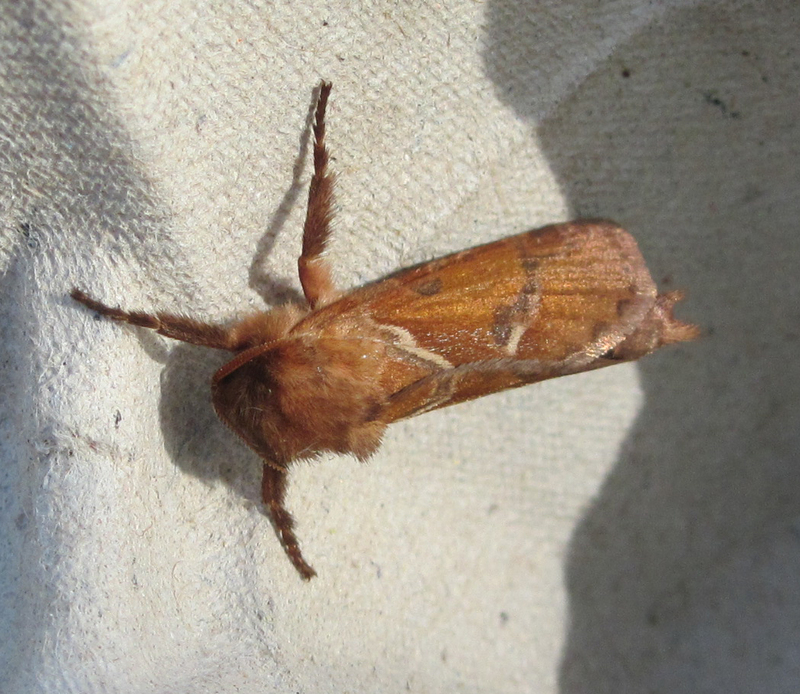 Brian tells me this is only the second record for Skye/Raasay since the Rothamsted days, Keith Sadler having had the first at Portnalong on 11th July last year. 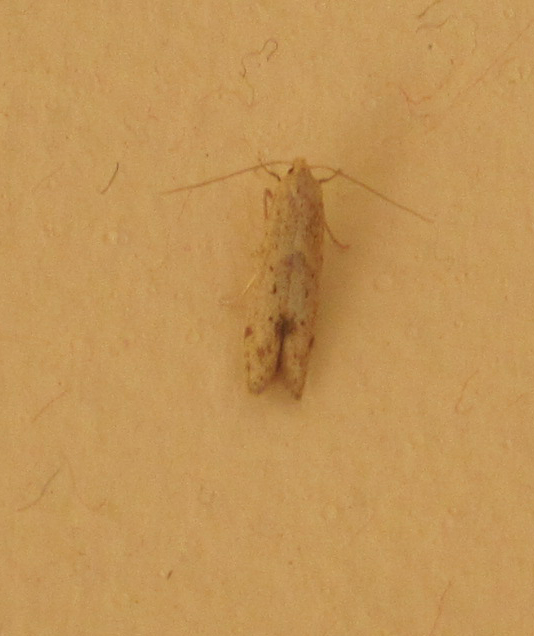 Meanwhile Keith kindly identified this micro-moth from our house as Blastobasis lacticolella. He had one in June and another a couple of days ago, (and 6 last July). Sometimes known as London Dowd or Wakely’s Dowd, it was introduced in western Europe in the nineteenth century and is now reported from The Netherlands, Great Britain and Madeira. Catriona used to warn me that this wasn’t the most exciting area botanically and yesterday’s trip confirmed this – though it was a great day to be up a hill and there were moments of botanical pleasure. There was a north-south column of five tetrads around here with no records and yesterday I sorted out the northernmost two as well as taking in the adjacent tetrads to the east. 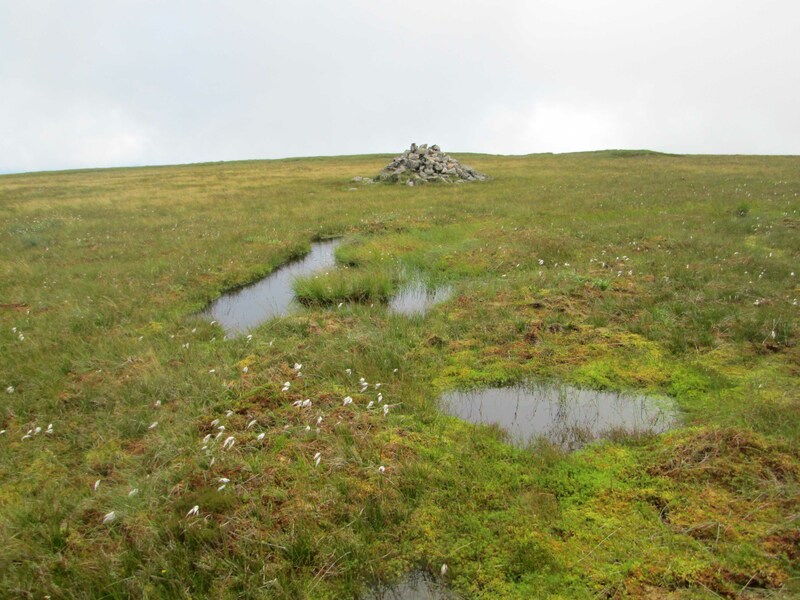 The top of Healabhal Mhor (Macleod’s Table North) with a summit at 471m was surprisingly wet and covered in a relatively high sward of vegetation – not the bare plateau I had expected. This limits its botanical interest considerably and leaves an existing record of Carex bigelowii (Stiff Sedge) as something of a mystery. 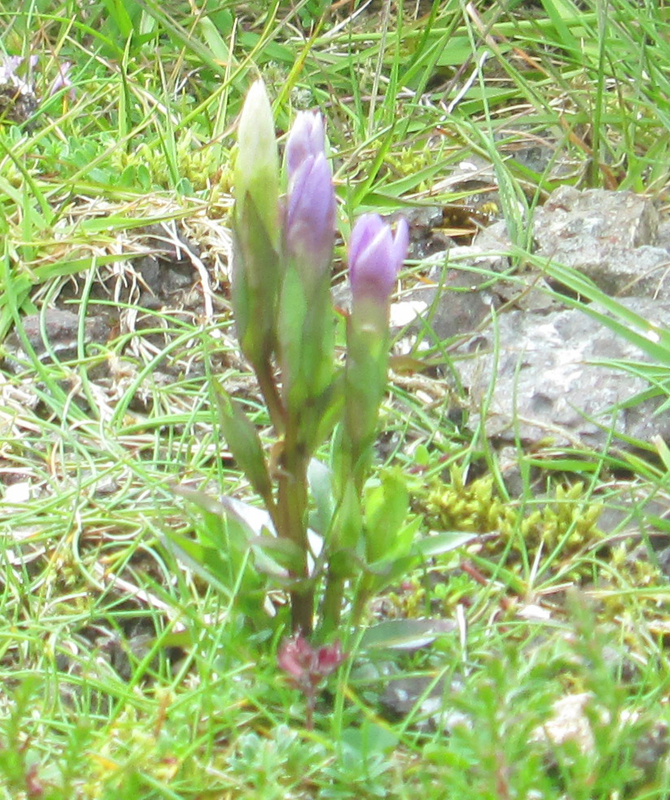 A small patch of Saussurea alpina (Alpine Saw-wort) on the north side of Healabhal Mhor at an altitude of about 300m was probably the highlight – it was not previously known from this hill and the last record for this 10km square (from Healabhal Bheag) was in 1968. It is not frequent on Skye away from the Cuillins. a bog provided records for Drosera x obovata (Obovate Sundew (D. rotundifolia x anglica)) and Utricularia stygia (Nordic Bladderwort) (to be confirmed, but even better if a different member of the U. intermedia aggregate). This is not what I saw on Fladaigh Chuain, but it is worth looking our for on exposed clifftops. 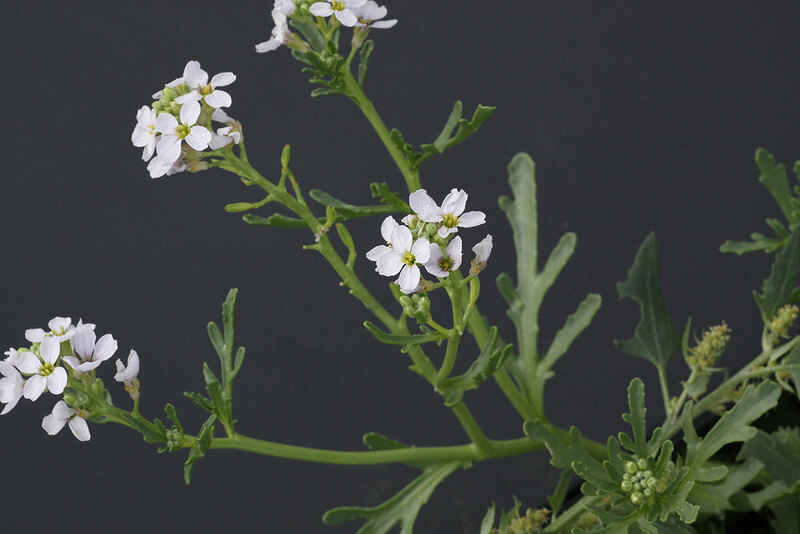 Note the shape of the basal leaves. 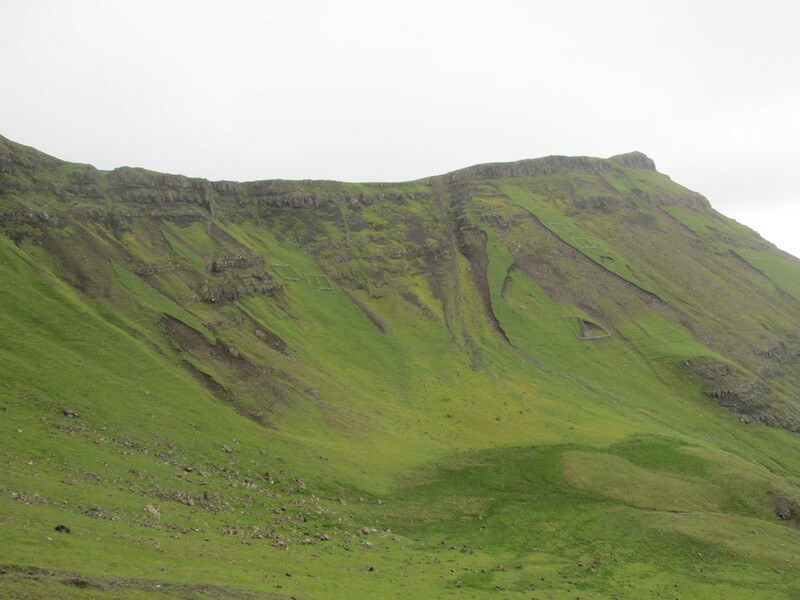 In the end, the Fladaigh Chuain lists featured 35 bryophytes and 92 or 93 vascular plants (Atriplex seen from the boat was probably A. glabriuscula seen on land, but it was impossible to be certain). Also recorded were 29 species of bird, some in large numbers and including a single peregrine. We managed a few other records including rabbit, grey and common seals, the first ant record from the islands, Myrmica ruginodis, our commonest red ant locally, and Arion ater (Great Black Slug). 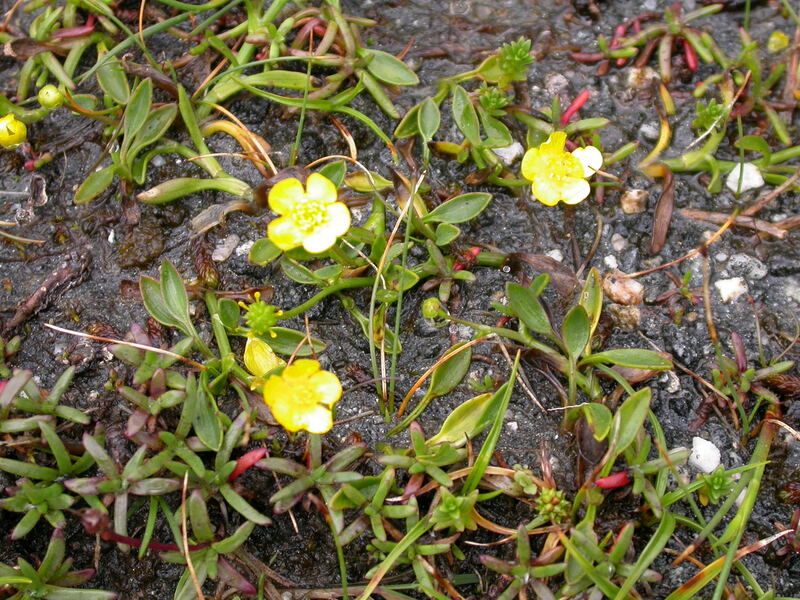 There was some distinctive-looking Ranunculus flammula (Lesser Spearwort) on Fladaigh Chuain with small flowers and glossy bright green leaves. I would like to make it R. flammula subsp. minimus which is known not far away in the Outer Isles, but it doesn’t seem right. The lowest leaves are key but it is possible that I just don’t have them on my specimen, which has now grown roots – so I will attempt to overwinter it. 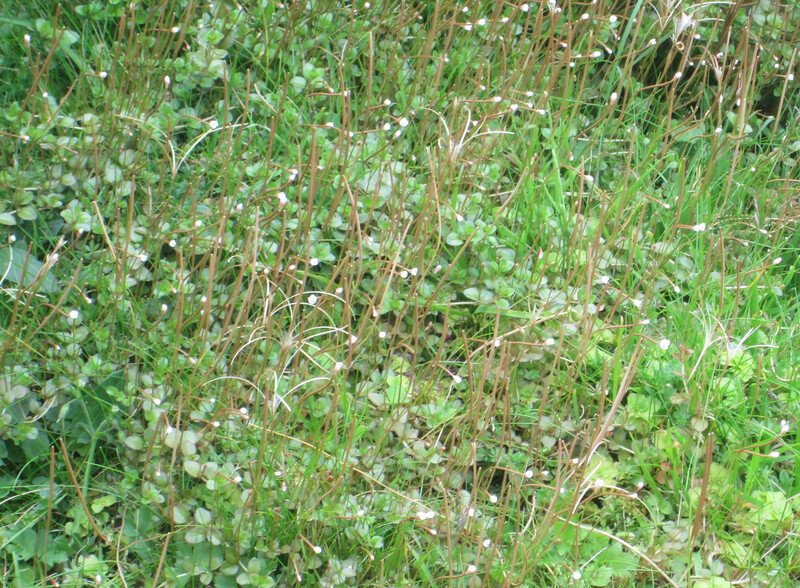 Jean has found Stellaria graminea (Lesser Stitchwort) in the Dunvegan area, the first record for 50 years in the 10 km square NG24. 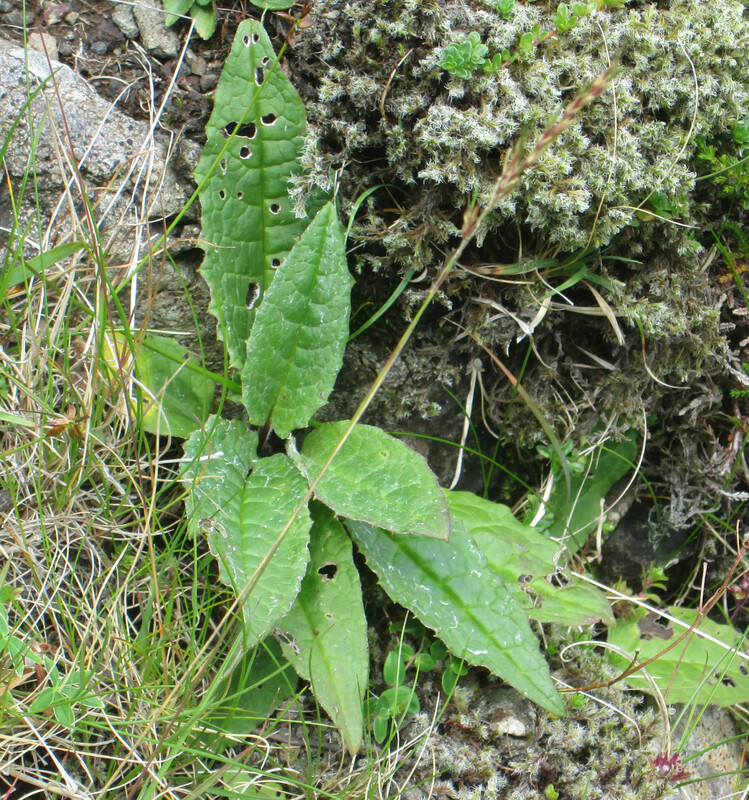 This remains the only plant ever found in the vice-county. 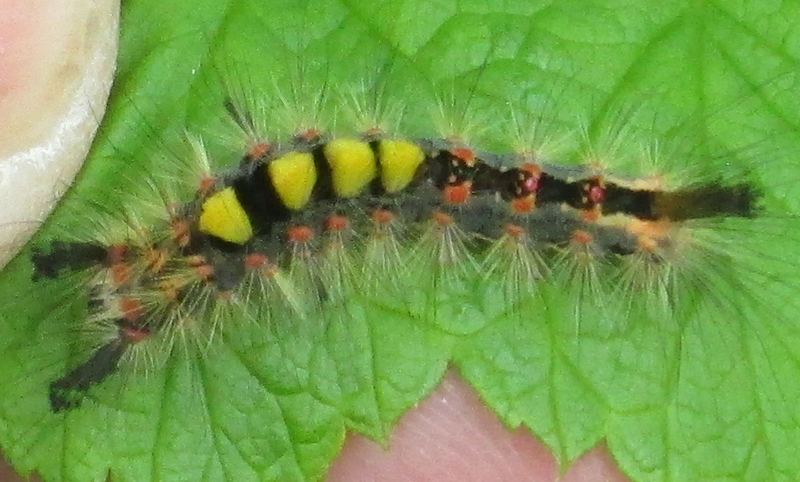 I found this in our fruit cage today – a final instar larva of The Vapourer moth: Brian tells me that he knows of only four Skye records, all 2012 or 2013, and no previous ones for Raasay. He also confirms my Emperor larva from near Loch Leathan.